Atlanta BeltLine is so much more than just trails, and our parks are true gems along the city’s “emerald necklace.” We hope our “Park of the Month” series will help you find greenspaces on the Atlanta BeltLine that you haven’t discovered yet, and maybe even show you something new about your favorite parks! For the month of August, we are highlighting D.H. Stanton Park. Located in the Peoplestown neighborhood in southwest Atlanta, the city re-opened the park on May 14, 2011 after undergoing full renovations. The area, once a landfill site, was transformed into eight acres of usable space that includes a splashpad, multi-use athletic fields, a little league baseball diamond and a new playground. The park is also home to a work of commissioned art by Robert Witherspoon that is centered within the park’s splashpad, which is open daily from 10 a.m. until 8 p.m. from May 1 through October 1. Kids playing in the splashpad at D.H. Stanton Park on Opening Day May 14, 2011. Setting it apart from other Atlanta BeltLine parks, D.H. Stanton is the first energy cost-neutral park in the City of Atlanta and among the first in the country. Through its extensive renovations, the park received photovoltaic solar panels that act as a shade structure. The panels convert sunlight directly into electricity, offsetting the park’s energy cost by selling the collected energy to Georgia Power. The panels, located at one of the park’s entrances, produce enough energy to power ten homes. Along with its many amenities, D.H. Stanton Park is a key location for runners and walkers during the Run.Walk.GO! series Southeast 8k, as well as home to many fitness classes. Check out upcoming fitness classes at D.H. Stanton Park on the July- September Fitness Class Schedule along with other ways to get fit and have fun along the Atlanta BeltLine. The Atlanta BeltLine Running Series took participants through D.H. Stanton Park for the 8k. D.H. Stanton Park thrives as a park built through community effort. Not only is the park supplying energy back into the community, but the funding to make the 8-acre greenspace is thanks to many private and public contributions. 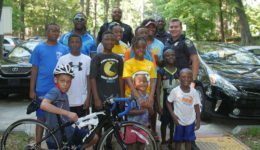 Donors include the Arthur M. Blank Family Foundation, City of Atlanta Park Improvement Bonds, the Atlanta BeltLine TAD, and a donation from the Atlanta BeltLine Partnership Capital Campaign. Family enjoying the playground at D.H. Stanton Park. For the duration of our Park of the Month series, we will be sharing your photos on Instagram, Facebook, and Twitter when you tag @atlantabeltline! Show us your D.H. Stanton Park photos until the end of August!